Note on May 4: I am very grateful to Jenda Johnson who pointed out an obvious typo--I had reversed P and S waves in the third paragraph! Sometimes the mechanics of doing this blog just numb out the brain! Thanks, Jenda! A magnitude 7.2 earthquake struck in the Acapulco/Mexico City region early this morning, a Good Friday holiday morning when many residents had apparently slept in or gone away on vacation. The earthquake lasted about 30 seconds. The epicenter was in the state of Guerrero, north of Acapulco. The U.S. Geological Survey has an automatic damage estimator here. The USGS estimates deaths between 1-100, and economic losses between 1-100 million; Max Wyss's estimator at WAPMER predicts 0-50 killed. In spite of damage reports there have been no reports (10 hours later) of fatalities, so there are likely to be very few if any as more information comes in. Why? One reason that many buildings in the area are built to be quake-resistent because of the history of previous earthquakes. But another reason is that Mexico has an early warning system for earthquakes, and the news has reported that a warning went out about 2 minutes before the quake (I have not been able to independently verify this). Mexico instituted a Seismic Alert System (SAS) for Mexico city as an experimental project in August 1991. By monitoring the arrival of the faster compressional ("P") waves, warnings can be issued before the arrival of the stronger shear ("S) waves. The system gives, on average, about 60 seconds warning for earthquakes generated in the Guerrero Gap. The quake was the result of a thrust motion where the Cocos plate is being subducted below the North American plate at a rate of about 65 mm/year. The Guerrero Seismic Gap is a ~200 km long segment of this plate boundary that has experienced no significant earthquakes since 1911 (M7.6 at that time). It is thought that an earthquake of magnitude greater than 8 is possible if the entire gap were to rupture at the same time. The development of the SAS was sponsored by the Mexico City Government, beginning operation in 1991. By the end of the first year, it was experimenting with providing warning to some public elementary schools, and was opened as a public service on commercial radio stations in 1993 after a successful alert that gave 65-73 seconds advance warning during two Guerrero earthquakes (M5.8 and M6) on May 14, 1993. Extensive planning for dissemination and education for the public followed. By 1998 the SAS detected 681 seismic events, 12 of which were strong enough to trigger the general early warning signals in Mexico City, one false one, and one earthquake well detected, but not warned. In the one false alarm, phenomena that were feared--such as panic that could cause injuries--did not occur, but it was realized that many members of the public had not been trained, and training of the public remained a high priority. The advantages of an early warning system are numerous: Casualties and fatalities are reduced by making people aware that strong ground shaking is imminent. Tsunami calculations can be initiated earlier. Traffic such as trains or subways can be stopped or slowed. The disadvantages or risks are the alerts may not be quick enough in areas close to the focus of the earthquake and subjected to strong shaking, that there can be false alarms, and that the technique is not good if there are multiple earthquakes close in time or location. Hence, there are tradeoffs between speed and accuracy. Continuous citizen education and awareness must be maintained, and a wide variety of channels of communication must be used to ensure wide dissemination. The private sector must be incorporated into the early warning system so that appropriate services/operations can be shut down for safety. The Polar Vortex: Good riddance! I was in Chicago earlier this week, and it was freezing cold once again. My friends in Illinois have had a miserable winter and it wasn't letting go easily. As I started to look at why it was so cold there mid-April, I discovered that I had a post that I started in the winter and didn't finish. It was about the "polar vortex," and I realized that I don't know very much about this thing. So, belatedly, here's my introduction to myself about the polar vortex. For more details and the references from which I took this material, see Skepticalscience, an excellent resource on climate, and the weather.com post here. We live in a portion of the atmosphere called the troposphere, and most of us have heard of the stratosphere, the layer of the atmosphere above the troposphere. The boundary between the two is the tropopause, and it's altitude varies considerably with the seasons. We in North America also live in the mid-latitudes, a region of mild temperatures that extends very very roughly between 30 and 60 degrees latitude. North of this (in the northern hemisphere, the reverse in the southern hemisphere) is the very cold polar air. The boundary between the two is the Polar Front, a collision zone between the warm moist and cold dry air. polar high (not shown). Graphic from weather.com. Distorted polar vortex (from same weather.com site as above. The polar vortex is contained by our jet stream (typically at around 35,000 feet altitude where airplanes fly). The jet stream is normally rather loopy, an instability known as Rossby waves, that arises because the Coriolis effect has a different magnitude at different latitudes. When one of loopy parts of the jet stream tokes an unusually deep plunge southward into the midwest, it brings air from the polar vortex and freezing temperatures southward. Note in both of the graphics that the main location of the low pressure zone stayed up north over Baffin Island, it's permanent home. The cold air aloft in the polar vortex sinks to the ground, displacing the lighter warmer (winter) air normally there. Rossby waves migrate, typically to the east, and so the disturbance moved on out of the midwest. Things warm up, and Chicago goes back to balmy 30+ degree nights in the winter! Here is an update on the Oso landslide from the USGS. My great friend and mentor of many decades died on Saturday a.m. after a long battle with cancer. Andrew, thank you for this wonderful tribute and for preserving my description of being in the field with him! E-an, whereever you are, we all miss you! "One of America's unsung senior geologists, E-an Zen, died on 29 March at the age of 85. 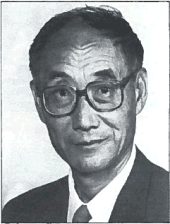 Born in China, he emigrated to the U.S. and earned a doctorate in 1955 from Harvard. A 30-year career followed at the U.S. Geological Survey, then 23 more years on the faculty of the University of Maryland. He was basically a mineralogist, but his field skills were formidable and he made large contributions to Appalachian geology, metamorphic petrology, and mapping of northern Rockies. Anyone who's looked into the literature of those fields has read his papers. He earned his full share of awards: membership in the National Academy of Sciences, the Geological Society of America's Day Medal, the Mineralogical Society of America's Roebling Medal, the Geological Society of London's Coke Medal, and more. In 1991 Susan Werner Kieffer, no slouch herself, recalled fieldwork with Zen: "I pride myself on being fit, but when I'm in the field with E-an, I'm always so out of breath that I can't talk, and thus I'm subjected to questions. For example, I was recently subjected to 3–4 days of questions about granites, migmatites, structural geology, epidote, and eucalyptus while working with E-an at the Cooma Granite in Australia. . . . I was so out of breath and confused by the rocks we were in that I wasn't providing him any feedback. E-an could sense my frustration and, with the sensitivity so characteristic of the man, politely changed the questions: to ones about scientific ethics, education, literacy, policy, religion, or philosophy—subjects about which he is deeply concerned." Those wider concerns marked Zen's tenure as president of the GSA in the early 1990s. In hisPresidential Address of 1992, published in GSA Today, he told his audience, "Science is too important to be left to the scientists. Geology directly impinges on human welfare and so cannot be an ivory-tower science. Conservation of the environment, discovery and recovery of Earth's resources, avoidance of natural hazards, disposal of wastes, forecasting of global change, decisions on land use, equity for the future—these and other issues need geological knowledge both for technical resolution and for guiding public policy. Public policy needs public support; we ignore the public at our peril." He went on to discuss scientific literacy, ethics, education and geologists' obligation to do public outreach. I wasn't there that day, but I recall being impressed when I read his words, and I continue to take his ideas seriously in my work here on About.com." A powerful earthquake off shore of Chile has generated a tsunami that has already produced six-to-seven-foot waves that have struck the beaches. The earthquake was centered about 60 miles northwest of Iquique and at a depth of about 12-13 miles. A tsunami warning has been issued for Colombia, Panama and Costa Rica, and geoscientists are working to determine the magnitude of tsunami waves at Hawaii and as far north as North America. UPDATE: Tuesday afternoon--The government of Chile has reported over 900,000 evacuated; CNN has reported a million. The major problem appears to be serious structural damage to poorly built homes. 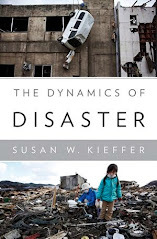 Chile has been subjected to powerful earthquakes several times over the past century: November 11, 1922, a magnitude 8.5; May 22, 1960 a magnitude 9.5; February 27, 2010 a magnitude 8.8, and today, a magnitude 8.0 or 8.2 (magnitudes are being revised as I write this). Charles Darwin experienced the 1835 earthquake in southern Chile in 1835, one that had a magnitude of 8.1 or 8.2. It triggered a tsunami that destroyed Talcahuano and devastated Concepcion. In this tsunami, a schooner was swept 200 meters inland. The earthquake took place in the middle of the day and inhabitants had time to run into the hills so the death toll was fortuitously low. Historical records going back to the 1500's suggest other great earthquakes. Why is Chile so prone to these quakes? 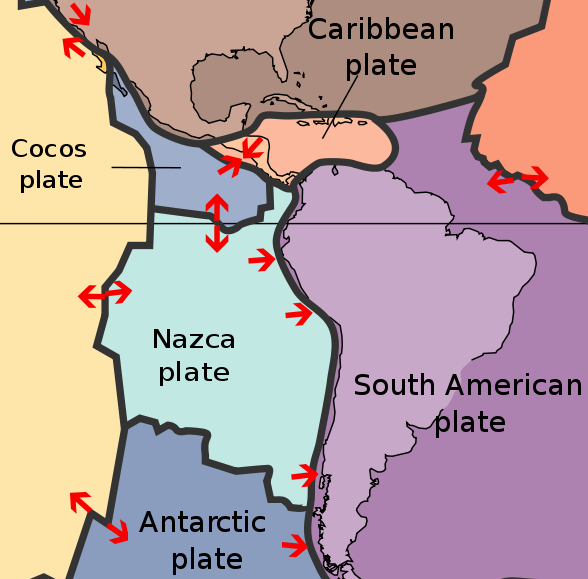 Off the west coast of Chile, the Nazca plate is diving down (being subducted) below the South American plate. 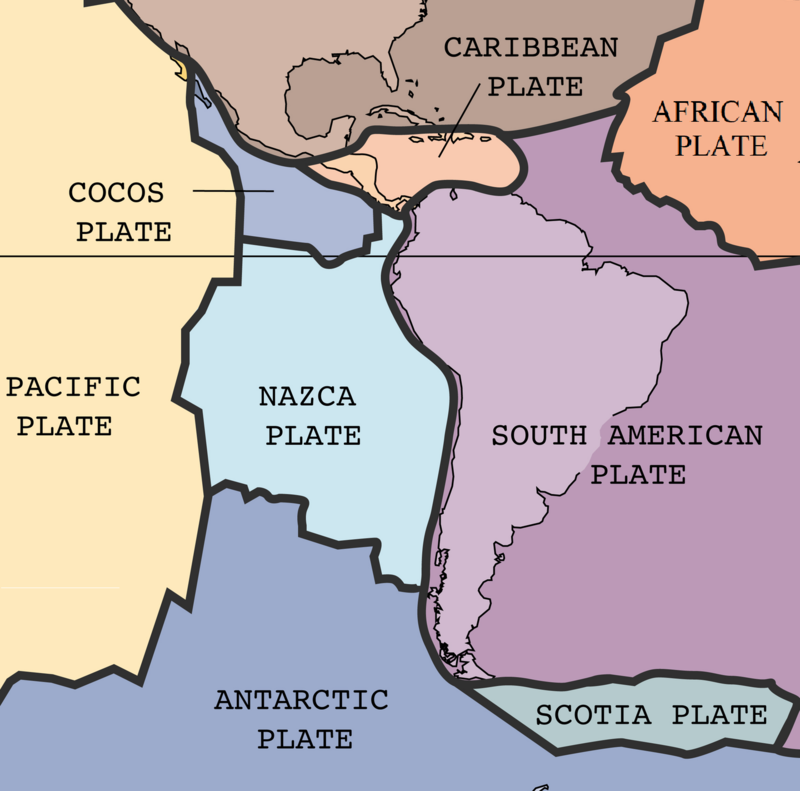 The Nazca plate is relatively young, having formed when the now-defunct Farallon plate split about 22.8 Mya split into the Nazca and Cocos plates. The plate is being subducted at a rate of 3.7 cm/year, one of the fastest motions of any tectonic plate. It dives so deeply under the South American plate that it even influences the geology and geography of Bolivia far inland to the east. The 1994 Bolivia earthquake of magnitude 8.2 occurred on this place and is renowned as the strongest earthquake occurring deeper than 300 km. In a nice review paper**, Susan Bilek discussed how the heterogeneity of the subducted plate causes there to be a wide variety of rupture modes along this zone, ranging from "magnitude >8 events during one century followed by smaller ones in other time periods, as well as unusual tsunami events." Her idea of the effect of heterogeneity is shown on the figure attached. The idea is that as various geographic features on the subducting plate--such as seamounts and ridges--enter the subduction zone, they change the friction in the zone. This acts, along with variations in the thickness of sediments in the overriding plate and in pore pressure in the sediments, to produce variability in the slip mechanisms along the fault. **Bilek, Susan L., Invited Review Paper: Seismicity along the South American subduction zone: Review of large earthquakes, tsunamis, and subduction zone complexity, Tectonophysics, 495 (2010), 2-14.